A community owned grocery store, open to all. Sugar Beet Food Co-op is more than your local grocery store. It is a hub for skill sharing and learning, and a beacon for the Good Food Movement. Show your planetary love on Earth Day! *Share your Earth Year Resolution on our Earth Day Inspiration Wall. *Learn how to convert your lawn space to food growing space with Deep Roots Project from 11am-2pm. 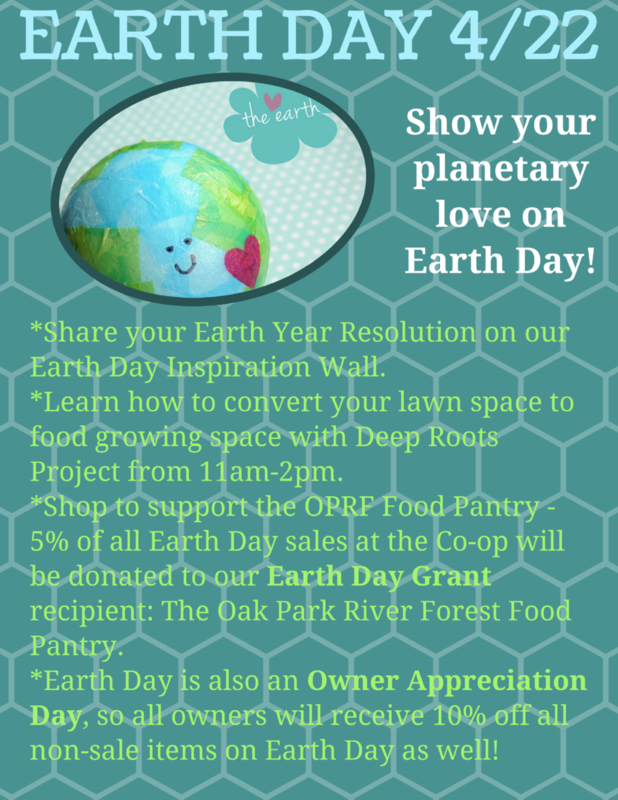 *Shop to support the Oak Park River Forest Food Pantry - 5% of all Earth Day sales at the Co-op will be donated to our Earth Day Grant recipient: The Oak Park River Forest Food Pantry. *Earth Day is also an Owner Appreciation Day, so all owner will receive 10% off all non-sale items on Earth Day as well!